As global population gallops towards the 10 billion mark, the amount of arable land isn’t growing in tandem. In fact, if global warming worsens, we can expect the amount of arable land to eventually start shrinking. Food security, therefore, remains a serious concern. Once again, technology is proving to be the one factor that will ensure the continuation of the human race as a species. There are several ways technology is transforming our food. We look at some of these below. Large farms can span several square kilometers. Farmers have to find ways of monitoring every corner of the farm without breaking the bank. Drones have been a godsend in this regard. They are a much cheaper option when compared to installing static cameras all over the farm or hiring farm hands to physically inspect the productivity of different areas. Advances in drone technology are making these gadgets more than just a tool for remote visual farm inspection. Farmers can not only see where damaged and diseased plants are but they can also use drones to release pesticides and fertilizers. The IoT has converted otherwise ordinary devices into powerful collectors of real-time data. 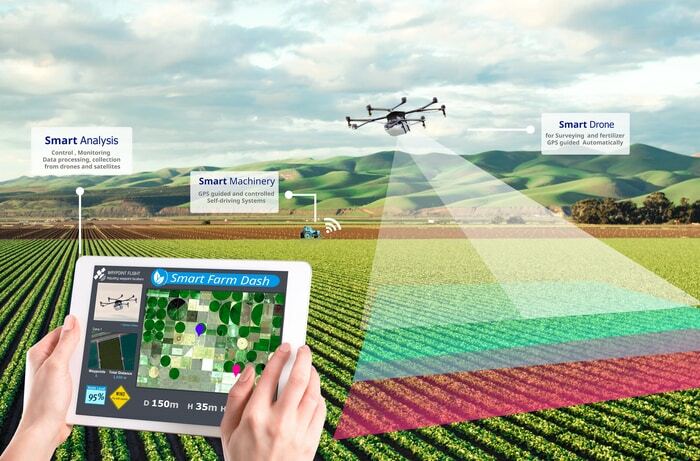 With the incorporation of sensors in crop yield monitoring and irrigation technology, farmers can have greater control over the entire crop lifecycle. Equipment sensors can collect soil content data and measure environmental factors to ensure optimal water use. Sensors installed in grain bins relay information on moisture, temperature levels, and destructive bug infestation. You could have a central infrastructure monitoring server that oversees not just the data but also checks the status of the various IoT devices used. An enormous amount of food finds its way to the trash each year. This is tragic not just because there are so many people who are sleeping hungry but also due to the work and time that went into the production of such food. All that effort goes to waste when the food is thrown away. Thanks to social media sites, web platforms, and food waste tracking apps, the amount of food waste can be drastically reduced. The specific approach will vary. For example, one app has partnered with restaurants by offering deals on food that is still suitable for consumption but is bound to be discarded to make way for fresher meals. Another platform matches households with leftovers to persons in their area who wouldn’t mind buying the food cheaply. Many people would be reluctant to eat meat created in a petri dish. But certain factors could change perceptions toward lab-grown meat. First, beef has a large carbon footprint. Second, the increase in the world’s population, as well as the rise in incomes in developing countries, will only continue to drive the demand for meat. Third, some people shun meat not because they think it’s bad food but due to their moral objection toward the killing of animals. Such persons would be more accommodating to lab-grown protein. With the first lab-grown beef burger showcased by Dutch scientists in 2013, it’s still early days. Nevertheless, the stars seem aligned to make this a revolutionary development in the not too distant future. Just like lab-grown meat, 3D-printed food isn’t something that will appeal to everybody. Still, it is bound to gain a disruptive foothold in certain market segments. For example, disabled and elderly persons may no longer be in a position to prepare elaborate meals on their own. In its simplest form, food printing involves adding ingredients to a food blender or processor then feeding this mixture to a 3D-printer to form various shapes. The more sophisticated the required output, the more complex the printing process becomes. 3D-printed food initially started with candy and chocolate but has moved onto burgers, pizzas and meatless meats. Technology has changed every facet of life so it isn’t surprising that it is making such an impact on the food we eat. This impact will only continue to grow.